Do You Run From Dry Clean Only Tags? Everyday, we are expected to run errands around town; groceries, playdates, meetings and many more errands can leave you spinning in circles. Fortunately, one of the errands that can be included is shopping. Do you have good shopping luck? Are you able to go straight in, find what you want, and purchase it on sale? It never seems that easy, one of the biggest hiccups to many shopping trips is the dreaded "dry clean only" warning on tags. But why do so many fear clothes that have to be dry cleaned. There are two obvious issues; price and traveling to the dry cleaners. The decision to dry-clean your clothes that require additional treatment is based on your desire to extend the life of your clothing. Many have made the mistake of placing a dry clean only garnment in the washing machine. The end result is often clothes that have not been affected or a ruined article of clothing. For the price that you pay for your silk ties and blouses, and wool pants the cost to dry clean each garnment is worth it. Mark Pressed4Time offers competitive pricing. On average delivered pants and blouses are only $6.75. Which, essentially takes care of more than one problem. 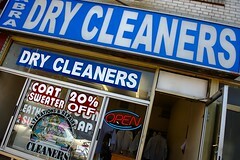 Price and travel; Mark Pressed4Time picks up and delivers dry cleaning for a low price. So, take risks and buy that fancy silk blouse and tie. Not only will Mark Pressed4Time pick up and drop off your dry cleaning but you will also receive a fair price for your dry cleaning. Contact Mark Pressed4Time and take the fear out of the term dry clean only.